A Small To Medium Size, Well Flaked And Finely Serrated Maud Arrowpoint That Exhibits Surface Sheen And Stone Aging Coloration Patination, Heavy One Side Aged Surface Deposits, Correct Concave Base And Serrated Blade Edges, Overall Aged Surface Patination, Aged Deposits In The Concave Base, Correct Material And Manufacture For The Area Found. This Example Is Very Finely Serrated, Displaying Overall Age. 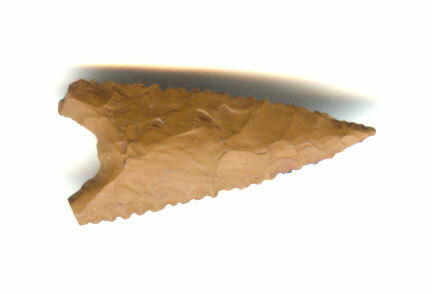 Maud Points Are Found With The Caddoan Moundbuilder Culture, Often In Caches Of Seven Or More And In Mortuary Context. This Is A Nice Example With Unusual Snapped Tangs.